For other places with the same name, see Isle of Wight (disambiguation). "IoW" redirects here. For other uses, see IOW (disambiguation). The Isle of Wight (/waɪt/; also referred to informally as The Island or abbreviated to IoW) is a county and the largest and second-most populous island in England. It is in the English Channel, between 2 and 5 miles off the coast of Hampshire, separated by the Solent. The island has resorts that have been holiday destinations since Victorian times, and is known for its mild climate, coastal scenery, and verdant landscape of fields, downland and chines. The quickest public transport link to the mainland is the hovercraft from Ryde to Southsea; three vehicle ferry and two catamaran services cross the Solent to Southampton, Lymington and Portsmouth. During the last Ice Age, sea levels were lower and the Solent was part of a river flowing south east from current day Poole Harbour towards mid-Channel. As sea levels rose, the river valley became flooded, and the chalk ridge line west of the Needles breached to form the island. The Isle of Wight is first mentioned in writing in Geography by Ptolemy. Bronze Age Britain had large reserves of tin in the areas of Cornwall and Devon and tin is necessary to smelt bronze. At that time the sea level was much lower and carts of tin were brought across the Solent at low tide for export, possibly on the Ferriby Boats. Anthony Snodgrass suggests that a shortage of tin, as a part of the Bronze Age Collapse and trade disruptions in the Mediterranean around 1300 BC, forced metalworkers to seek an alternative to bronze. During Iron Age Britain, the Late Iron Age, the Isle of Wight would appear to have been occupied by the Celtic tribe, the Durotriges - as attested by finds of their coins, for example, the South Wight Hoard, and the Shalfleet Hoard. South eastern Britain experienced significant immigration that is reflected in the genetic makeup of the current residents. As the Iron Age began the value of tin likely dropped sharply and this likely greatly changed the economy of the Isle of Wight. Trade however continued as evidenced by the remarkable local abundance of European Iron Age coins. Julius Caesar reported that the Belgae took the Isle of Wight in about 85 BC, and recognised the culture of this general region as "Belgic", but made no reference to Vectis. The Roman historian Suetonius mentions that the island was captured by the commander Vespasian. The Romans built no towns on the island, but the remains of at least seven Roman villas have been found, indicating the prosperity of local agriculture. First-century exports were principally hides, slaves, hunting dogs, grain, cattle, silver, gold, and iron. Ferriby Boats and later Blackfriars Ships likely were important to the local economy. Starting in AD 449 (according to the Anglo Saxon Chronicles) the 5th and 6th centuries saw groups of Germanic speaking peoples from Northern Europe crossing the English Channel and setting up home. Bede's (731) Historia ecclesiastica gentis Anglorum identifies three separate groups of invaders: of these, the Jutes from Denmark settled the Isle of Wight and Kent. From then onwards, there are indications that the island had wide trading links, with a port at Bouldnor, evidence of Bronze Age tin trading, and finds of Late Iron Age coins. 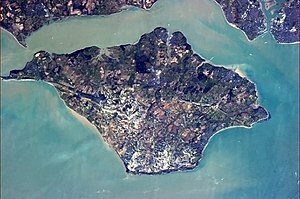 The Norman Conquest of 1066 created the position of Lord of the Isle of Wight; the island was given by William the Conqueror to his kinsman William FitzOsbern. Carisbrooke Priory and the fort of Carisbrooke Castle were then founded. Allegiance was sworn to FitzOsbern rather than the king; the Lordship was subsequently granted to the de Redvers family by Henry I, after his succession in 1100. The island continued to be attacked from the continent: it was raided in 1374 by the fleet of Castile, and in 1377 by French raiders who burned several towns, including Newtown[clarification needed], and laid siege to Carisbrooke Castle before they were defeated. During the English Civil War, King Charles fled to the Isle of Wight, believing he would receive sympathy from the governor Robert Hammond, but Hammond imprisoned the king in Carisbrooke Castle. In the 1860s, what remains in real terms the most expensive ever government spending project saw fortifications built on the island and in the Solent, as well as elsewhere along the south coast, including the Palmerston Forts, The Needles Batteries and Fort Victoria, because of fears about possible French invasion. The world's first radio station was set up by Marconi in 1897, during her reign, at the Needles Battery, at the western tip of the island. In 1898 the first paid wireless telegram (called a "Marconigram") was sent from this station, and the island was for some time the home of the National Wireless Museum, near Ryde. The oldest records that give a name for the Isle of Wight are from the Roman Empire: it was then called Vectis or Vecta in Latin, Iktis or Ouiktis in Greek. From the Anglo-Saxon period Latin Vecta, Old English Wiht and Old Welsh forms Gueid and Guith are recorded. In Domesday Book it is Wit; the modern Welsh name is Ynys Wyth (ynys = island). These are all variant forms of the same name, possibly Celtic in origin. It may mean "place of the division", because the island divides the two arms of the Solent. The island is one of the most important areas in Europe for dinosaur fossils. The eroding cliffs often reveal previously hidden remains, particularly along the Back of the Wight. Dinosaur bones and fossilised footprints can be seen in and on the rocks exposed around the island's beaches, especially at Yaverland and Compton Bay. As a result, the island has been nicknamed "Dinosaur Island" and Dinosaur Isle was established in 2001. 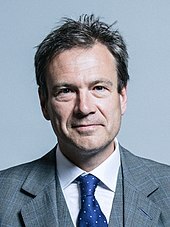 Member of Parliament for the Isle of Wight Bob Seely. The island has a single Member of Parliament and 138,300 permanent residents in 2011, being one of the most populated constituencies in the United Kingdom (more than 50% above the English average). However, in 2011 the Parliamentary Voting System and Constituencies Act was to have changed this, as part of the Sixth Periodic Review of Westminster constituencies, but this was deferred to no earlier than October 2018 by the Electoral Registration and Administration Act 2013. Thus the single constituency remained for the 2015 and 2017 general elections. However, two separate East and West constituencies are proposed for the island under the 2018 review now under way. Elections in the constituency have traditionally been a battle between the Conservatives and the Liberal Democrats. Andrew Turner of the Conservative Party gained the seat from Peter Brand of the Lib Dems at the 2001 general election. Since 2009, Turner was embroiled in controversy over his expenses, health, and relationships with colleagues, with local Conservatives having tried but failed to remove him in the runup to the 2015 general election. He stood down prior to the 2017 snap general election, and the new Conservative Party candidate Bob Seely was elected with a majority of 21,069 votes. At the Isle of Wight Council election of 2013, the Conservatives lost the majority which they had held since 2005 to the Island Independents, with Island Independent councillors holding 16 of the 40 seats, and a further five councillors sitting as independents outside the group. The Conservatives regained control, winning 25 seats, at the 2017 local election. There have been small regionalist movements: the Vectis National Party and the Isle of Wight Party; but they have attracted little support at elections. The island is well known for its cycling, and it was included within Lonely Planet's Best in Travel Guide (2010) top ten cycling locations. The island also hosts events such as the Isle of Wight Randonnée and the Isle of Wight Cycling Festival each year. A popular cycling track is the Sunshine Trail which starts in Newport and ends in Sandown. In May 1999 a group of local women made history by becoming the first ladies' crew to row around the island, in ten hours and twenty minutes. Rowers from Ryde Rowing Club have rowed around the island several times since 1880. The fours record was set 16 August 1995 at 7 hours 54 minutes. The route around the island is about 60 miles (97 km) and usually rowed anticlockwise. Even in good conditions, it includes a number of significant obstacles such as the Needles and the overfalls at St Catherine's Point. The traditional start and finish were at Ryde Rowing Club; however, other starts have been chosen in recent years to give a tidal advantage. The now-disbanded Ryde Sports F.C., founded in 1888, was one of the eight founder members of the Hampshire League in 1896. There are several non-league clubs such as Newport (IW) F.C. There is an Isle of Wight Saturday Football League with two divisions and two reserve team leagues , and a rugby union club. The Isle of Wight is the 39th official county in English cricket, and the Isle of Wight Cricket Board organises a league of local clubs. Ventnor Cricket Club competes in the Southern Premier League, and has won the Second Division several times. Newclose County Cricket Ground near Newport opened officially in 2009 but with its first match held on 6 September 2008. The island has produced some notable cricketers, such as Danny Briggs, who plays county cricket for Sussex. The island is home to the Isle of Wight Festival and until 2016, Bestival before it was relocated to Lulworth Estate in Dorset. In 1970, the festival was headlined by Jimi Hendrix attracting an audience of 600,000, some six times the local population at the time. It is the home of the band The Bees, Trixie's Big Red Motorbike. The largest industry is tourism, but the island also has a strong agricultural heritage, including sheep and dairy farming and arable crops. Traditional agricultural commodities are more difficult to market off the island because of transport costs, but local farmers have succeeded in exploiting some specialist markets, with the higher price of such products absorbing the transport costs. One of the most successful agricultural sectors is now the growing of crops under cover, particularly salad crops including tomatoes and cucumbers. The island has a warmer climate and a longer growing season than much of the United Kingdom. Garlic has been successfully grown in Newchurch for many years, and is even exported to France. This has led to the establishment of an annual Garlic Festival at Newchurch, which is one of the largest events of the local calendar. A favourable climate supports two vineyards, including one of the oldest in the British Isles at Adgestone. Lavender is grown for its oil. The largest agricultural sector has been dairying, but due to low milk prices and strict legislation for UK milk producers, the dairy industry has been in decline: there were nearly 150 producers in the mid-1980s, but now just 24. Maritime industries, especially the making of sailcloth and boat building, have long been associated with the island, although this has diminished somewhat in recent years. GKN operates what began as the British Hovercraft Corporation, a subsidiary of (and known latterly as) Westland Aircraft, although they have reduced the extent of plant and workforce and sold the main site. Previously it had been the independent company Saunders-Roe, one of the island's most notable historic firms that produced many flying boats and the world's first hovercraft. Bembridge Airfield is the home of Britten-Norman, manufacturers of the Islander and Trislander aircraft. This is shortly[when?] to become the site of the European assembly line for Cirrus light aircraft. The Norman Aeroplane Company is a smaller aircraft manufacturing company operating in Sandown. There have been three other firms that built planes on the island. The island's heritage is a major asset that has for many years supported its tourist economy. Holidays focused on natural heritage, including wildlife and geology, are becoming an alternative to the traditional British seaside holiday, which went into decline in the second half of the 20th century due to the increased affordability of foreign holidays. The island is still an important destination for coach tours from other parts of the United Kingdom. Tourism is still the largest industry, and most island towns and villages offer hotels, hostels and camping sites. In 1999, it hosted 2.7 million visitors, with 1.5 million staying overnight, and 1.2 million day visits; only 150,000 of these were from abroad. Between 1993 and 2000, visits increased at an average rate of 3% per year. At the turn of the 19th century the island had ten pleasure piers, including two at Ryde and a "chain pier" at Seaview. The Victoria Pier in Cowes succeeded the earlier Royal Pier but was itself removed in 1960. The piers at Ryde, Seaview, Sandown, Shanklin and Ventnor originally served a coastal steamer service that operated from Southsea on the mainland. The piers at Seaview, Shanklin, Ventnor and Alum Bay were all destroyed by various storms during the 20th century; only the railway pier at Ryde and the piers at Sandown, Totland Bay (currently closed to the public) and Yarmouth survive. The island a news website, Island Echo, which was launched in May 2012. The island has a local commercial radio station and a community radio station: commercial station Isle of Wight Radio has broadcast in the medium-wave band since 1990 and on 107.0 MHz (with three smaller transmitters on 102.0 MHz) FM since 1998, as well as streaming on the Internet. Community station Vectis Radio has broadcast online since 2010, and in 2017 started broadcasting on FM 104.6. The station operates from the Riverside Centre in Newport. The island is also covered by a number of local stations on the mainland, including the BBC station BBC Radio Solent broadcast from Southampton. Other online news sources for the Isle of Wight include On the Wight. The Isle of Wight is near the densely populated south of England, yet separated from the mainland. This position led to it hosting three prisons: Albany, Camp Hill and Parkhurst, all located outside Newport near the main road to Cowes. Albany and Parkhurst were among the few Category A prisons in the UK until they were downgraded in the 1990s. The downgrading of Parkhurst was precipitated by a major escape: three prisoners (two murderers and a blackmailer) escaped from the prison on 3 January 1995 for four days, before being recaptured. Parkhurst enjoyed notoriety as one of the toughest jails in the United Kingdom, and housed many notable inmates including the Yorkshire Ripper Peter Sutcliffe, New Zealand drug lord Terry Clark and the Kray twins. There are 69 local education authority-maintained schools on the Isle of Wight, and two independent schools. As a rural community, many of these are small and with fewer pupils than in urban areas. The Isle of Wight College is located on the outskirts of Newport. From September 2010, there was a transition period from the three-tier system of primary, middle and high schools to the two-tier system that is usual in England. Some schools have now closed, such as Chale C.E. Primary. Others have become "federated", such as Brading C.E. Primary and St Helen's Primary. Christ the King College started as two "middle schools," Trinity Middle School and Archbishop King Catholic Middle School, but has now been converted into a dual-faith secondary school and sixth form. Victoria and Abdul (2017) starring Dame Judi Dench and Ali Fazal began shooting principal photography at Osborne House in September 2016. ITV's dramatisation of Dennis Potter's work Blade on the Feather (19 October 1980) was filmed on the island. The 1984 TV mini series , Annika, was partly filmed in Ryde. The setting for Free Rein was based on the Isle of Wight. ^ As well as the former Princess Beatrice during World War II, most otherwise notable was Lord Mountbatten in 1969–1974, after which he became Lord Lieutenant until his assassination in 1979. ^ "Chris Hadfield on Twitter". ^ "Queen appoints new Lord-Lieutenant of the Isle of Wight". GOV.UK. Retrieved 9 April 2019. ^ "2011 Census, Key Statistics for Local Authorities in England and Wales". Office for National Statistics. 2011. Archived from the original on 5 January 2016. Retrieved 29 November 2016. ^ a b "Hampshire & IoW election results: Conservatives take control". BBC News. 5 May 2017. Retrieved 9 August 2017. ^ "Isle of Wight Festival history". Redfunnel.co.uk. Retrieved 25 September 2010. ^ "Isabella de Fortibus, "Queen of the Wight" - English Heritage". ^ "Portsmouth agrees to launch Solent Combined Authority bid". BBC. Retrieved 10 December 2016. ^ "Solent Combined Authority bid 'almost certainly dead'". BBC News. BBC. Retrieved 25 October 2017. ^ Lagarde et al. 2003., J.L. "The structural evolution of the English Channel area". Journal of Quaternary Science. Special Issue: The Quaternary History of the English Channel March - May 2003. 18 (3.4): 201–213. ^ Adams, William Henry Davenport (1877). Nelsons' hand-book to the Isle of Wight. Oxford University. Retrieved 16 March 2015. ^ a b Hawkes, C. F. C. (July 1984). "Ictis disentangled, and the British tin trade". Oxford Journal of Archaeology. 3 (2): 211–233. doi:10.1111/j.1468-0092.1984.tb00327.x. Retrieved 16 March 2015. ^ Snodgrass, A.M. (1966). Arms and Armour of the Greeks. Thames & Hudson, London. ^ Snodgrass, A.M. (1971). The Dark Age of Greece. Edinburgh University Press, Edinburgh. ^ Williams, Jonathan; Hill, J.D., Portable Antiquities Scheme, Record ID: IOW-38B400. ^ Leins,Ian; Joy, Jody; Basford, Frank , Portable Antiquities Scheme, Record ID: IOW-EAAFE2. ^ Leslie, et al. 2015, Stephen (2015). "The fine-scale genetic structure of the British population". Nature. 519 (March 2015): 309–314. doi:10.1038/nature14230. PMC 4632200. PMID 25788095. Retrieved 29 March 2015. ^ Wellington, Imogen (February 2001). "Iron Age Coinage on the Isle of Wight". Oxford Journal of Archaeology. 20 (1): 39–57. doi:10.1111/1468-0092.00122. ^ Crawford, Osbert Guy Stanhope (1912). "The distribution of early bronze age settlements in Britain". Geographical Journal. 1912: 184–197. ^ Adams, William Henry Davenport (1877). Nelson's Hand-book to the Isle of Wight. Oxford. ^ a b "Romano-British Occupation". Vectis. Retrieved 28 January 2018. ^ The Journal of the British Archaeological Association (PDF). December 1866. Archived from the original (PDF) on 29 November 2016. Retrieved 28 November 2016. ^ "Saxon Graves at Shalfleet". Isle of Wight History Centre. August 2005. Archived from the original on 1 November 2006. ^ Williams, Peter N. "England, A Narrative History". Britannia.com. Retrieved 25 September 2010. ^ Harding, Samuel B. "The English Accept Christianity". The Story of England. ^ The Anglo Saxon Chronicle. 1116. ^ "Anglo-Saxon Isle of Wight: 900 - 1066 AD". 2012. Retrieved 30 November 2016. ^ "Victoria County History". British History Online, University of London & History of Parliament Trust. 1912. Retrieved 30 November 2016. ^ McMahon, Rob. "Why Populations". McMahon. Retrieved 28 January 2018. ^ Bede, the Venerable (790). Ecclesiastical History of the English People. Harmondsworth: Penguin. ^ Smith, Oliver; et al. (27 February 2015). "Sedimentary DNA from a submerged site reveals wheat in the British Isles 8000 years ago". Science. 347 (6225): 998–1001. doi:10.1126/science.1261278. PMID 25722413. ^ Cunliffe, Barry (2008). A Companion to Roman Britain: Britain and the continent: networks of interaction. John Wiley & Sons. pp. 1–11. ISBN 9780470998854. ^ Balter, Michael. "DNA recovered from underwater British site may rewrite history of farming in Europe". Science. Retrieved 17 March 2015. ^ "The Isle of Wight Ingot Hoard". The Art Fund. ^ English Heritage. "Isabella de Fortibus, "Queen of the Wight"". English Heritage Story of England. Retrieved 28 November 2016. ^ Fernández Duro, Cesáreo (1995). La Marina de Castilla. Madrid. ISBN 978-84-86228-04-0. ^ Chisholm, Hugh (1911). The Encyclopædia Britannica: A Dictionary of Arts, Sciences, Literature and General Information. Encyclopædia Britannica. p. 627. ^ English Heritage. "English Heritage Story of England". Retrieved 28 November 2016. ^ "Fort Nelson History". Royal Armouries. Retrieved 8 June 2008. ^ "Isle of Wight history and heritage". visitisleofwight.co.uk. Retrieved 28 November 2016. ^ Lee, Eric (2005). How internet radio can change the world: an activist's handbook. New York: iUniversr, Inc. ISBN 9780595349654. Retrieved 22 March 2015. ^ "Connected Earth". Archived from the original on 2 April 2015. Retrieved 22 March 2015. ^ "What happened to the National Wireless Museum?". Retrieved 19 June 2018. ^ Julia Skinner (2012). Isle of Wight: A Miscellany. www.francisfrith.com. ISBN 978-1-84589-683-6. ^ "PLUTO pumping station, Sandown, Isle of Wight". D-Day Museum and Overlord Embroidery. Archived from the original on 16 February 2015. Retrieved 16 February 2015. ^ "Welcome to Britain's secret Cape Canaveral (... on the Isle of Wight)". London Evening Standard. 31 March 2007. Retrieved 16 February 2015. ^ "Movies". Movies.msn.com. Retrieved 25 September 2010. ^ "Isle of Wight Festival History 1968 to Today". isleofwightguru.com. Retrieved 28 November 2016. ^ "VECTIS - Roman Republic". romanrepublic.org. ^ Staff writer(s); no by-line (1987–2012). "St Boniface Down, England". Peakbagger.com. Retrieved 11 December 2012. ^ Hopson P. (2011). "The geological history of the Isle of Wight: an overview of the 'diamond in Britain's geological crown'" (PDF). Proceedings of the Geologists' Association. 122 (5): 745–763. doi:10.1016/j.pgeola.2011.09.007. ^ "Fossil and Dinosaur Hunting". redfunnel.co.uk. Retrieved 28 November 2016. ^ Booth K.A. & Brayson J. (2011). "Geology, landscape and human interactions: examples from the Isle of Wight" (PDF). Proceedings of the Geologists' Association. 122 (5): 938–948. doi:10.1016/j.pgeola.2011.01.004. ^ "Isle of Wight Climate Statistics". Archived from the original on 21 April 2008. ^ weatheronline.co.uk. "Frost Days data 2000-2008 St Catherine's Point". Retrieved 28 November 2016. ^ "Hardiness Zone Map for Europe". GardenWeb. 1999. ^ "Operation Squirrel". Iwight.com. Archived from the original on 28 June 2009. Retrieved 25 September 2010. ^ "Deer could damage Island warning". Iwcp.co.uk. 17 August 2010. Archived from the original on 11 October 2014. Retrieved 26 March 2013. ^ "Natural History of Red Deer". Wildlife Online. 27 April 2010. Retrieved 12 September 2013. ^ "Glanville Fritillary". UK Butterflies. Retrieved 28 November 2016. ^ "Pyramidal orchid". Plantlife. Retrieved 10 March 2016. ^ "Turner Will Fight On For 'Unique' Island Status". Isle of Wight Chronicle. 6 July 2010. Archived from the original on 20 April 2013. ^ "Isle of Wight Set To Have Two MPs in 2015". Isle of Wight Chronicle. 15 February 2011. Archived from the original on 4 November 2011. ^ "Isle Of Wight MP Andrew Turner survives no confidence vote". BBC. 24 January 2015. ^ "Isle of Wight council results". BBC News. 29 April 2013. ^ Adam Grydehøj and Philip Hayward (2011). Autonomy Initiatives and Quintessential Englishness on the Isle of Wight (PDF). Island Studies Journal. p. 185. ^ "Newport Parish Council, Isle of Wight, Official Website". Newport Parish Council - Isle of Wight. Retrieved 7 March 2016. ^ University of Leeds (1959). "Survey of English Dialects: Whitwell, Isle of Wight". British Library. Retrieved 28 November 2016. ^ W Long (1886). A dictionary of the Isle of Wight dialect (PDF). Reeves & Turner, London. ^ Lavers, Jack (1988). The Dictionary of the Isle of Wight Dialect. Dovecote Press. ISBN 978-0-946159-63-5. ^ "Oiled birds may be linked to Ice Prince sinking". The Daily Telegraph. UK. 16 January 2008. Retrieved 25 September 2010. ^ UK Government (1972). "Local Government Act 1972". Retrieved 28 November 2016. ^ "Flag institute". Flag institute. 6 July 2010. Retrieved 25 September 2010. ^ "Why are natives of the Isle of Wight known as 'caulkheads'? - Notes and Queries". www.theguardian.com. Retrieved 23 September 2016. ^ "Celebrate all things Island on Isle of Wight Day". www.redfunnel.co.uk. Retrieved 27 November 2016. ^ a b "Default What happened to the National Wireless Museum?". Retrieved 19 June 2018. ^ Ryde Rowing Club (1999). "Record round the Isle of Wight row". University of Oxford. Retrieved 28 November 2016. ^ redfunnel.co.uk. "About Gus McKechnie - Fundraising Legend!". Retrieved 28 November 2016. ^ "Skandia Cowes Week 2008 – Welcome". Skandiacowesweek.co.uk. Retrieved 25 September 2010. ^ "JPMorgan Asset Management Round the Island Race". Roundtheisland.org.uk. Retrieved 25 September 2010. ^ "Rolex Commodores' Cup – Home". Rorc.org. Retrieved 25 September 2010. ^ "Club directory". Isle of Wight Council. Retrieved 28 November 2016. ^ "Wight Flyers Trampoline & Gymnastics Club". Wight Flyers. Retrieved 28 November 2016. ^ "Isle Of Wight Marathon Race". Rydeharriers.co.uk. Archived from the original on 24 February 2011. Retrieved 25 September 2010. ^ "Isle of Wight Hockey Club". Isle of Wight Hockey Club. Retrieved 28 November 2016. ^ "The Isle has produced several high profile players including Kevin "The Hitman" Broderick, now playing for a local Sunday side. Isle Of Wight Rugby Football Club". Iwrfc.co.uk. Retrieved 25 September 2010. ^ "Isle of Wight Sport". Archived from the original on 13 May 2007. Retrieved 15 May 2007. ^ "Isle of Wight County Cricket Ground". Isle of Wight Cricket Board. Retrieved 25 September 2010. ^ "Newclose: Cricket Scoreboard Arrives | Isle of Wight News". Ventnor Blog. 10 July 2008. Archived from the original on 21 November 2008. Retrieved 25 September 2010. ^ "Newclose County Cricket Ground Open Days". Isle of Wight Cricket Board. Retrieved 21 November 2008. ^ "Scooter rally takes place on Isle of Wight". bbc.co.uk. 27 August 2013. Archived from the original on 29 August 2013. Retrieved 29 August 2013. ^ "Concerts with Record Attendance". Noiseaddicts.com. Retrieved 5 August 2017. ^ "Trixie's Big Red Motorbike – Discover music, concerts, stats, & pictures at". Last.fm. 11 February 2009. Retrieved 15 March 2012. ^ "Annual estimates of NUTS3 regional Gross Value Added (GVA)". Office for National Statistics. 2014. Retrieved 29 November 2016. ^ "Key census statistics, Isle of Wight Authority area". 2011. Archived from the original on 6 January 2009. Retrieved 16 August 2011. ^ "Wine for Sale – Vineyard Tours, Isle of Wight". English Wine. Archived from the original on 18 July 2010. Retrieved 25 September 2010. ^ "Isle of Wight lavender farm, lavender products, lavender plants, teas". Lavender.co.uk. Retrieved 25 September 2010. ^ Antony Barton. "Saunders-Roe/Westland Aircraft/British Hovercraft Corporation". Retrieved 28 November 2016. ^ "Isle of Wight wind turbine firm Vestas creates 200 jobs". BBC News. 5 February 2015. Retrieved 18 September 2016. ^ "A list of aircraft and airplane manufacturers as well as airfields on the Isle of Wight". Daveg4otu.tripod.com. Retrieved 25 September 2010. ^ Ian West (2016). "Petroleum Geology - South of England: The Portland - Isle of Wight Offshore Basin". Southampton University. Retrieved 28 November 2016. ^ "about us". Goddards-brewery.co.uk. Archived from the original on 9 March 2001. Retrieved 25 September 2010. ^ "Yates' Brewery". Yates-brewery.co.uk. Retrieved 25 September 2010. ^ "Isle of Wight Nostalgia". Retrieved 17 May 2016. ^ "A POTTED HISTORY OF ISLE OF WIGHT HOLIDAYS". redfunnel.co.uk. 2014. Retrieved 29 November 2016. ^ "A website with Isle of Wight statistics for investors". Investwight.com. Archived from the original on 27 March 2009. Retrieved 25 September 2010. ^ "The World's Oldest Amusement Parks". Huffington Post. Retrieved 28 November 2016. ^ "Isle of Wight walking holidays". Wight Walks. Retrieved 25 September 2010. ^ "Welcome to the official website of the Isle of Wight Walking Festival 2013". Isleofwightwalkingfestival.co.uk. Retrieved 26 March 2013. ^ "Isle of Wight Coastal Path". Long Distance Walkers Association. Retrieved 29 November 2016. ^ "Draft Tourism Development Plan" (PDF). Isle of Wight Council. 2005. Retrieved 28 November 2016. ^ "Coastal Adventure: Isle of Wight". Kingswood Camps. Retrieved 28 November 2016. ^ "Southern Vectis bus route map". Southern Vectis. Retrieved 28 November 2016. ^ "Summer Southsea-Sandown hovercraft route plans dropped". 4 July 2015. Retrieved 9 February 2017. ^ "Isle of Wight Steam Railway". Isle of Wight Steam Railway. Retrieved 29 November 2016. ^ "Isle of Wight Cycle Hire & Cycling Guide - Isle Cycle - Cowes & Sandown". ^ "Island Echo". island Echo. Retrieved 22 July 2015. ^ "Isle of Wight Radio 107.0 Newport". internetradiouk.com. Retrieved 28 November 2016. ^ ""History of Our Station" and "Gallery"". Angel Radio Isle of Wight Website. Retrieved 28 October 2007. ^ "The Record Library". Angel Radio Isle of Wight Website. Retrieved 20 August 2016. ^ "On The Wight". On The Wight. Retrieved 7 October 2012. ^ "The Big Tower: Chillerton Down". thebigtower.com. Retrieved 28 November 2016. ^ "Isle of Wight Prison information". UK Justice Department. Retrieved 29 November 2016. ^ James Cusick (10 January 1995). "The Parkhirst (sic) Breakout: Fugitives were trapped by the sea". The Independent Newspaper. Retrieved 29 November 2016. ^ "Schools and Learning". Isle of Wight Council. Retrieved 29 November 2016. ^ David Newbie (25 September 2009). "It's all change in schools' shake up". Isle of Wight County Press. Retrieved 29 November 2016. ^ "Palaces for the People - Panoramic Views". ^ "The Lost Talismans of Spirit of the Stones". Archived from the original on 7 February 2005. ^ "The Isle of Wight's Literary Connections". h2g2.com. 2013. Retrieved 29 November 2016. ^ Tayell, Frank (2013). Surviving the Evacuation Book One London. ^ "Sgt. Pepper's Lonely Hearts Club band". Lib.ru. 16 May 1996. Retrieved 25 September 2010. ^ The Navy Lark Volume 24: You're A Rotten!. amazon.co.uk. ASIN 1408468735. ^ "Blade on the Feather (1980)". Internet Movie Database. Retrieved 29 November 2016. ^ "Top Gear on the Isle of Wight, starring Red Funnel and the Military Road". Isle of Wight Guru. Retrieved 17 March 2016. ^ "Isle of Wight". yoppul.co.uk. Retrieved 2019-02-10. 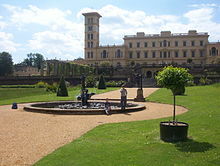 Look up Isle of Wight in Wiktionary, the free dictionary. Wikivoyage has a travel guide for Isle of Wight. "The Isle of Wight Film"